"Force de frappe" redirects here. For other uses of frappe, see Frappé. The Force de frappe (French for: strike force), or Force de dissuasion after 1961, is the designation of what used to be a triad of air-, sea- and land-based nuclear weapons intended for dissuasion, the French term for deterrence. The French Nuclear Force, part of the Armed Forces of France, is the third largest nuclear-weapons force in the world, following the nuclear triads of the Russian Federation and the United States. France has deactivated all land-based nuclear missiles. On 27 January 1996, France conducted its last nuclear test (in the South Pacific) before signing the Comprehensive Nuclear-Test-Ban Treaty (CTBT) in September 1996. In March 2008, President Nicolas Sarkozy confirmed reports giving the actual size of France's nuclear arsenal and he announced that France would reduce its French Air Force-carried nuclear arsenal by 30%, leaving the Force de Frappe with 290 warheads. In addition to its nuclear military programme, France has a large peaceful nuclear programme and ranks as one of the world's largest generators of nuclear power. The decision to arm France with nuclear weapons was made in 1954 by the administration of Pierre Mendès-France under the Fourth Republic. President Charles de Gaulle, upon his return to power in 1958, solidified the initial vision into the well-defined concept of a fully independent Force de Frappe capable of protecting France from a Soviet or other foreign attack, independent of the North Atlantic Treaty Organization, which President de Gaulle considered to be dominated by the United States to an unacceptable degree. In particular, France was concerned that in the event of a Soviet invasion of Western Europe, the US—already bogged down in the War in Vietnam and afraid of Soviet retaliation against the United States proper—would not come to the aid of its Allies in Western Europe. According to de Gaulle, France should never trust its defense and therefore its very existence to a foreign and thus unreliable protector. Sir, I have no quarrel with you, but I warn you in advance and with all possible clarity that if you invade me, I shall answer at the only credible level for my scale, which is the nuclear level. Whatever your defenses, you shan't prevent at least some of my missiles from reaching your home and causing the devastation that you are familiar with. So, renounce your endeavour and let us remain good friends. While not referred to as such, the French nuclear posture of the time bears some significant similarities to other common policies of the era such as Mutually Assured Destruction and Massive Retaliation. It remains unknown whether the French government ever seriously considered their policy different from other NATO member strategies or if their public statements were more aimed to improve morale and confidence in the French population. Certainly, France's position in the 1960s and the 1970s required some changes in posture. After the French withdrawal from the integrated command structure of NATO to pursue their own defense systems, their position with their NATO allies was less clear. Equally, both the French government and the French public took pride in their independence from US control and their ability to defend their own interests without NATO aid against the Warsaw Pact, if necessary. As a result, statements of nuclear policy spoke of a confrontation with the Soviet Union directly and without allied support, but that was very unlikely as France remained in NATO. However, no matter the scenario it would have been extremely impolitic for France to imply they would not join a wider NATO war but wait for a threat on their own soil or to say that they would use nuclear weapons against West Germany, Italy or Belgium, the only places from which Soviet forces could advance on France. It may seem on the surface that an avowed policy of attacking civilians was a significant departure from the typical nuclear policies of the time, but it was common for states to refer to their nuclear abilities in terms of numbers of cities destroyed, and the power of hydrogen bombs makes it is unclear how different attacks on populations and military forces would be. Perhaps the most significant difference in French strategy is that it includes the option of a first strike attack even in response to non-nuclear provocation. France carried out its first test of an atomic bomb in Algeria in 1960 and some operational French nuclear weapons became available in 1964. Then, France executed its first test of the much more powerful hydrogen bomb over its South Pacific Ocean test range in 1968. President de Gaulle's vision of the Force de Frappe featured the same triad of air-based, land-based and sea-based weapons deployed by both the United States and the Soviet Union. Work on these components had started in the late 1950s and was accelerated as soon as de Gaulle became the President of France. Initially, the Force de Frappe consisted of an airbase component of the Strategic Air Forces Command (Commandement des Forces Aeriennes Strategique (CFAS)) of the French Air Force, established in 1955 and operating 40 Sud Aviation Vautour IIB bombers. These were considered marginal for a strategic bomber role and work began almost immediately on a replacement resulting in the Mirage III. In May 1956 a requirement for what became the Dassault Mirage IV bomber was drawn up; this bomber was designed to carry AN-11 nuclear gravity bombs over targets in the Eastern bloc at supersonic speeds and was declared operational in October 1964. It has been modernized since then and converted to carry its successor the AN-22 bomb. The Mirage IV-P version was later armed with the ASMP missile and entered service in 1986. All bomber versions of the Mirage IV retired in 1996. From 1973 until 2003 the CFAS also operated SEPECAT Jaguars which were limited nuclear capable by using the tactical AN-52 nuclear bomb which were certified for supersonic flight. A total of 100 were built between 1972-1982. They were compatible with modified Mirage III fighters and later with the standard Jaguar. The Mirage 2000 was in theory capable of carrying it but never did. The AN-52's were deactivated and placed into storage in 1991. The Mirage 2000N entered service from 1988 and is capable of carrying gravity bombs, the ASMP and the new longer-ranged ASMP-A missile which entered service 2009. The Mirage 2000N is being replaced by the Dassault Rafale F3 as of 2011. A Pluton missile mobile launcher. The land-based component of the French nuclear triad was added in August 1971 when 18 silo-based S2 medium-range ballistic missiles (MRBMs) achieved operational readiness at French Air Force Aerial Base 200 of Saint Christol Albion in the Vaucluse region of southern France. Later, this land-based component was augmented with the mobile shortrange Pluton missile and Hadès missile, which were designed to be launched from the front lines at any approaching foreign army. To defend against a Soviet/Warsaw Pact invasion of West Germany, these could be deployed with the French Army in the French Zone of Germany in western Germany. Since the French military judged that a full-scale invasion of Western Europe by the Soviet Union and its Warsaw Pact Allies was unlikely to be stopped by conventional armaments, these short-range nuclear missiles were meant as a "final warning" (ultime avertissement in French) which would tell the aggressor that any further advances would trigger a nuclear armageddon upon its major cities and other important targets. 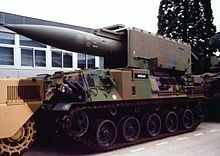 The Pluton missile, introduced in 1974, was retired from service and scrapped beginning in 1993 and its successor, the Hadès missile, was produced in limited numbers during the early 1990s and then withdrawn from the Army and placed in arsenal storage in 1995. Next, the French Government decided to eliminate all of these missiles and the last Hadès was dismantled on 23 June 1997. That was the end of the French mobile land-based nuclear missiles. The French fixed S3 IRBMs at the Plateau d'Albion, were considered to be approaching obsolescence and also deemed to be no longer necessary following the fall of the Soviet Union, were also disposed of. The silos have been imploded and the missile base closed 1999, eliminating the landbased missile leg of the French nuclear triad. The ocean-based, mobile component of the French nuclear triad entered service in December 1971 with the commissioning of its first ballistic missile submarine, the nuclear submarine Le Redoutable, which carried 16 M4 Intermediate Range Ballistic Missiles similar to the former US Polaris missiles. Since then, the ocean-based French nuclear weapons arsenal has been expanded to a squadron of 4 submarines, 1 of which is always on patrol. Since 1985, some of the French ballistic missile subs have become obsolete. These subs have been retired and replaced by newer subs that also have 16 missile tubes apiece and carry the more advanced French M45 missile. A new submarine, the Le Terrible, was put into service on 20 September 2010, armed with the M51 missile, which is similar to the US Trident II. The Aeronavale or French Naval Aviation has operated a fleet of nuclear-armed aircraft since 1962, with the Dassault Etendard IV on its Clemenceau-class aircraft carriers. The Etendard could be armed with AN-52 nuclear gravity bombs. In 1978, the Dassault Super Etendard entered service, giving the Aeronavale a stand-off nuclear strike ability via its Air-Sol Moyenne Portée (ASMP) nuclear missiles. As the Clemenceau class retired from 1997 to 2000, the Super Etendard remained in service on the succeeding R91 Charles-de-Gaulle. Since 2010 it carries Rafale F3 fighters armed with the upgraded ASMP-A nuclear missiles. France no longer possesses land-based nuclear missiles. The IRBM base at the Plateau d'Albion (Vaucluse region) was deactivated in 1999 and its missiles scrapped. All French Army units equipped with short-range missiles such as the Pluton and the Hadès were disbanded, their missiles scrapped and their fissile nuclear materials recycled. The Redoutable, the first French nuclear missile submarine. The French Navy includes a nuclear strategic branch, the Force Océanique Stratégique, which has contained as many as 5 nuclear-powered ballistic missile submarines. 6 Redoutable class submarines, armed with 16 M4 IRBMs entered service between 1971 and 1985. The last of these, the L'Inflexible (S 615), was retired from service in 2008. 1 Le Terrible (S 619) commissioned in 2010, armed with 16 of the more modern M51 missile, successfully tested in 2010. 3 Triomphant-class SSBNs: the Le Triomphant (S 616), the Le Téméraire (S 617), the Le Vigilant (S 618), armed with 16 of the less modern M45 missile. They will be upgraded to the new M51 missile by 2018, Le Vigilant will be the first to be upgraded, starting in 2011. Appx 50 could arm the Air Force to be carried by Mirage 2000N long-range multirole fighters. Strike detachments of these aircraft are based at Luxeuil Air Base, Istres Air Base and Avord Air Base. Since 1 July 2010, a new squadron of Rafale N (N for Nuclear) has been declared fully operational as EC 1/91 Gascogne in Saint-Dizier BA 113. About 15 more could arm the Aviation navale to be carried by the French Navy's Rafale (M version, for Marine). These aircraft are landbased at Landivisiau Naval Air Base and on the aircraft carrier Charles de Gaulle when at sea. Thus they can be operated flexibly. The Rafale M is also certified to operate from United States Navy aircraft carriers. 10 ASMP's are permanently in overhaul and form the reserve. The locations of the nuclear missiles are secret (although many storage facilities are already known to the public, the number of warheads inside is classified and changes frequently). The range of strike aircraft is extended currently by the KC-135 and in the future by the forthcoming Airbus A330 MRTT aerial refueling fleet. The Jupiter Command Post is a structure in the bunker of the Élysée Palace. It is equipped with means of communication and protection to enable the president of France and his advisers to manage crisis situations and to be in contact at all times with other government entities, military command posts and foreign governments. The bunker was built for President Albert Lebrun in 1940 during the Phoney War, and President Valéry Giscard d'Estaing installed its command post in 1978. ^ "France to reduce nuclear arsenal, warns of Iran danger". 21 March 2008. ^ Serge Gadal, (2009). Forces aériennes stratégiques: histoire des deux premières composantes de la dissuasion nucléaire française. Economica. p.86. ISBN 2717857583. Quote: "Dans dix ans, nous aurons de quoi tuer 80 millions de Russes. Eh bien je crois qu'on n'attaque pas volontiers des gens qui ont de quoi tuer 80 millions de Russes, même si on a soi-même de quoi tuer 800 millions de Français, à supposer qu'il y eût 800 millions de Français." ^ Blair, W. Granger (13 February 1960). "France Explodes Her First A-Bomb in a Sahara Test". New York Times. p. 1. Retrieved 5 November 2010. ^ a b "Mer et Marine". Mer et Marine.